The author, having embraced all of these destressing feelings, takes the reader on an unprecedented treasure hunt to find that illusive perfect religion. And after 50 years of digging he might have hit the mother lode—The Sermon on the Mount. Will it satisfy those still searching for the truth. Will it reaffirm the faith of those who have found the treasure? Will this truth set those shackled to a confused state free? The author addresses the problem head on. 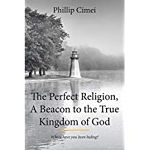 He weaves through the maze of controversy, theological mumbo jumbo, and religious opinions to give answers to why there is so much division in the church. And why so many wandering souls are searching, if not in their heart, from church to church. He uses captivating illustrations—a girl with a moose, a boy ravaged with a flesh-eating disease, and a vulture eyeballing a starving child, to bring to life Christ’s quest to show those wandering souls the way. “Will I truly find God?” you ask. “I complained I had no shoes, until I met a boy who had no feet.” My wonderful and godly mother-in-law, Violet Johnson, would always use that quote (I interjected boy where man was used in the original saying). I use it in this book to illustrate poor in spirit. I use it to refer to a little boy who could teach us what poor in spirit really means. Tornadoes were a given in Oklahoma. But a different kind of storm hit Jeremiah’s town, his school, and sadly enough, him. This one was catastrophic. Oologah Public Schools was the pride of this community. Though small in size, it was an A+ school and only one of seven schools statewide chosen for this prestigious honor. The school was resilient. It overcame the twister that destroyed its buildings in 1991. But the damage this new storm would impose, now twenty years down the road, couldn’t be repaired with bricks, mortar, hammers, and nails. The school would birth a monster storm that would devour seven innocent little children, and Jeremiah would find himself one of those in its devastating path. The air was filled with chatter intermingled with playful laughter. It was recess time at Oologah Elementary. The playground buzzed with active children doing what they knew best. But an ominous black cloud would interrupt their jovial mood and would send the children, the parents, and the community into a panic. Some of those children would say goodbye to not only their childhood, but to some of their classmates. In less than twenty-four hours, two students would be dead and five other children would come in contact with a storm called meningitis. Viral meningitis was manageable, but this was bacterial meningitis. And Jeremiah would soon find out how life-changing it would be. He had a fever. His mother frantically petitioned God for healing as she stood in the ER listening to the doctor’s diagnosis, “His fever, vomiting, and rash appear to be Roseola, but considering I lost one child today to meningitis, I don’t want to take a chance.” Her short-lived hope faded as fast as Jeremiah’s childhood dreams. It was meningitis, and it had entered his blood releasing septic toxins. Jeremiah lay there in a medically induced coma. His body was thrown into the piranha-infested waters of this ravenous monster. Amputation could only stop this feast. All that remained of arms and legs were nubs. His face was also devoured; his lips deformed and void of that once impish smile; his eyelids were removed and unable to fan away his tears; his facial features, once poster child handsome, now a patchwork of skin grafts. A little boy shouldn’t have to wake to a nightmare of this proportion. He couldn’t verbalize his fears as he awoke to his new world. The hole in his throat would only allow him to speak with God. His family and church pleaded on his behalf, but he must ask God, “Why? Why won’t I be able to whistle at a bird, run as swift as a deer, or climb a tree like a playful squirrel on a fall morning? Will I ever be able to catch a fish again, hold a roasted marshmallow, throw a winning touchdown, or hit the game winning homerun?” And what did God whisper back? God might have said, “Be brave, my little soldier; in due time, you will again have your childhood. Be patient for I need you to give hope to the downtrodden, vision to the complainers, and be a light to those smitten with a dark cloud of tragedy like yours. But you will have to work hard and prepare.” Jeremiah’s emotional challenges would outweigh the physical ones. Through tearful eyes he watched others run, skip, and try to balance on skateboards while he attempted to balance on stubby artificial feet. Day after day, hour after hour, one step then another, one new task, one more obstacle. No complaints or moaning about his dull regimental life. Ahead, more repetitive, wearisome tasks. Once he conquered walking, he still had to learn to operate prosthetic arms and hands. While other children were picking up crayons, he was struggling to pick up a spoon, a cup, or even a comforting stuffed animal. He would not succumb to what others thought was a dull and boring childhood. God eventually allowed Jeremiah to learn to walk with blade runners. Year after year, he would rely on God to overcome. One day when a company that produced prosthetics was holding a conference at one of the hospitals where Jeremiah lived, Jeremiah made a surprise visit. Tears flowed that day as he walked in, by himself, to a crowd overcome with emotions. God would use this little boy to let the world know that even though our body is racked with disease, our spirit, if dependent on God, will lift us up and help us overcome. We will find happiness in God, not ourselves. What does this have to do with poverty of spirit? Jeremiah understood that his body was devastated by a disease and that he would have to be dependent on God to overcome it. He emptied his heart of what he wanted and filled it with what God wanted for him.